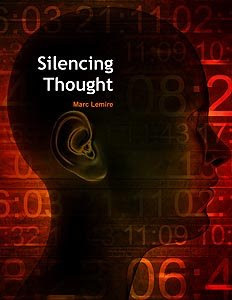 Back in December 2008, Marc Lemire, the webmaster of the Freedomsite, announced the upcoming release of his new book entitled “Silencing Thought: The Human Rights Industry’s War on Freedom of Expression”. The book will be a compilation of 5 years worth of research on the Canadian Human Rights Commission and their fellow censorship travelers. A tentative release date for the book was scheduled for February, 2009. That release date is now being pushed back to April 1, 2009. The reason for the delay is two fold. 1: A respectable publisher approached Mr. Lemire about publishing a book, and that is ongoing. 2: One of the allegations that Marc Lemire is making in the book is so explosive, it could well lead to another RCMP investigation of the CHRC. Due to the nature of the allegations and information, Mr. Lemire wants to get additional confirmation before proceeding. Who is Marc Lemire and what is this book all about? The abuses uncovered by Lemire and his extremely talented lawyer Barbara Kulaszka – have been widely reported across Canada. The National Post called Marc Lemire a “principled free-speech martyr” and the evidence Lemire and Kulaszka brought forward contributed to a “landmark disaster for the Canadian Human Rights Commission”. Marc Lemire is a certified computer systems engineer and human rights victim consultant based in Toronto. He is the webmaster of the Freedomsite, which is a resource of freedom oriented material, including the largest archive in Canada of information exposing the ravenous censorship of the Canadian Human Rights Commission. In 2006, Lemire won the prestigious "George Orwell Free Speech Award" for his courageous defence of freedom and open debate. Lemire is a member of Canada's largest professional journalist organization. 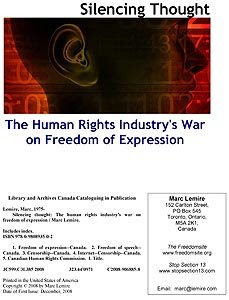 Silencing Thought, will be a 200+ page expose of the Canadian Human Rights Commission and internet censorship by fanatics. How the law came about. How it is being used and abused. How the CHRC has infiltrated the internet and Canadian ISPs. Not only will the book cover all of the above information — there will be a fifty-page appendix of original documents which will shake Canadians to their core, when they see how bad the human rights fanatics really are and what they are really up to. As just a taste of what’s in Silencing Thought:… guess who the biggest Internet racists, haters and neo-Nazis are? Is it an underground army of tattooed, beer swilling skinheads? The National Socialist Party of Canada? Tom Winnicki? White Supremacists? Muslim Extremists? French Nationalists? Islamic Rage Boy? Neo-Nazis? Terry Tremaine? Ezra Levant? Mark Steyn? FreeDominion? NO…. amazingly it’s the Edmonton Police “Hate Crimes” Unit! -> All their hate posts documented in sickening detail and court transcripts showing the police officers admitting to making these hate posts.